With dozens of exciting rides, more than 40 daily live shows and a historical atmosphere that resembles the Ozarks during the 19th century, it's easy to see why Silver Dollar City theme park is one of Branson's top attractions and was named to have the 'Best Theme Park Holiday Event' for 2017. With so many unique shops, rides, public tours, and adventures, visitors are sure to have an amazing time at this famous Ozark mountain theme park. 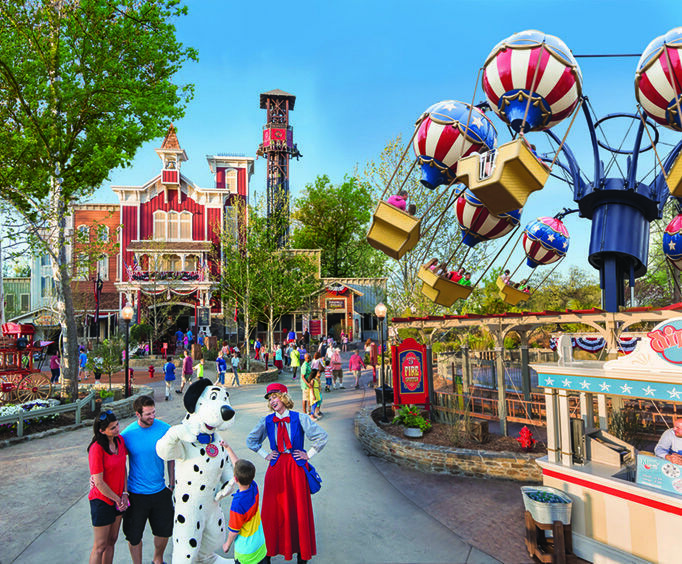 Modeled after an 1800s town, Silver Dollar City offers entertainment for everyone in the family, featuring more than thirty thrilling rides and attractions, quaint shops and even artisans that create and sell traditional crafts and goods. Whether you're enjoying one of the many shows, like Great American Country Nights in Echo Hollow, watching craft demonstrations, shopping in one of the many shops or braving one of the thrilling roller coasters, everyone is sure to have a blast. Look out for Silver Dollar City's newest additions available in 2019! This season is to be known as the year of shows and festivals, featuring brand new events such as the Echo Hollow & Saloon show, the new Country Music Days featuring iconic country music and Saturday Night Celebrity concerts in Echo Hollow, and the new Harvest Festival featuring Craft Days & Pumpkin Nights which feature a new Lumberjack Show and pumpkin-themed events. During the Star-Spangled Summer festival, enjoy the Broadway-style musical entitled Reuben's Swashbuckling Adventure and see Kid Magic, starring Kadan Bart Rockett & Brooklyn from America's Got Talent. This year's Festival of Wonder goes on from April 10 until April 28, and there are brand new shows for guests to enjoy. See Phoenix Fire, Harp Extreme, and all new acts at the CirqUnique show. While at Silver Dollar City, be sure to visit Marvel Cave and embark upon a fun cave tour which is included with your admission price. The cave was first discovered by the Osage Indians in the early 1500s. It was originally named 'Marble Cave' because the ceiling resembled marble. Marvel Cave is also one of the biggest caves in Missouri, has one of the largest cave entry rooms (the Cathedral Room) in North America, and has been in operation longer than most tourist attractions in the area. Tom & Huck's RiverBlast - You'll get wet while you shoot a super soaker water gun at over 150 targets. The GIANT Barn Swing - Soar up to 45 mph and over 7 stories on two pendulum arms that hold 32 people! WildFire - A high-flying, multi-looping coaster that reaches speeds of 66 mph for one of the best roller coaster experience. PowderKeg - Coaster that launches from 0 to 53 mph in just 2.8 seconds for some of the fastest fun at the park. The Grand Exposition - 10 different family rides including spinning teacups, flying elephants, and breezy swings. Outlaw Run - The world's most daring wood coaster with the steepest drop and three upside-down twists that are sure to thrill. Fireman's Landing, a family-centered area, features six new and fun rides and four new play zones that are perfect for the whole family. Stop by and experience all the excitement! Time Traveler: The Time Traveler ride is the newest exciting addition to the Silver Dollar theme park! This stunning ride gives a thrill with rotating carts, vertical drops, and more. Silver Dollar City train - Ride the train around Silver Dollar City for an amazing look at the theme park! Heartland Home Furnishings - Beautiful, hand-crafted solid oak furniture. The Greatest Gift - Inspirational treasures for you and your loved ones. Apple Butter Shop - Various types of apple butter, jams, jellies, and other fruit butters. Hazel's Blown & Cut Glass Factory - Remarkable blown glass items and decorations. The fantastically lit up Christmas on Main Street is one of the best light and tree shows in the nation, featuring a musical 5-story Christmas Tree that twinkles and dances in unison to over a million dazzling lights that illuminate the city's square. Emblazoned in over 200,000 lights, the Rudolph's Holly Jolly Christmas Light Parade winds its way through the streets of the city twice each evening. Hear Christmas music classics at shows such as The Living Nativity and Frosty. Watch A Dickens' Christmas Carol, a musical production, and even see the jolly old elf himself at Kringles Krossing. Weather permitting, you can also spend the holidays enjoying your favorite rides and attractions during an Old Time Christmas. Take home beautiful holiday memories destined to last a lifetime. Do not miss out on roller coaster fun, unique shops, and tons of amazing events the next time you are in Branson, MO! Visitors to Silver Dollar City are sure to have a great time with their whole family, making it the perfect addition to your vacation. All park shows held outside the theater, special event activities, and rides are included. Are wheelchairs and strollers available at Silver Dollar City?If so, is there a rental fee? Standard wheelchairs are available for rental. ATMs, lockers, restrooms, shops, and restaurants are available. Casual dress is recommended. Must wear shoes, shirt, and family-appropriate clothing. Yes, parking is available. There are priority parking sections available for a fee. Are lockers available at Silver Dollar City? If so, is there a fee? Yes, lockers are available for a small fee. Silver Dollar City is 110 acres. Are alcoholic beverages served at Silver Dollar City? Alcohol is not served at Silver Dollar City. Is smoking allowed inside Silver Dollar City? Smoking is allowed at designated smoking areas. Those looking for an all-American way to spend their springtime vacation will find Silver Dollar City's Bluegrass and BBQ Festival's electrifying musical performances and mouth-watering barbeque food to be the perfect solution. Moonlight Madness is a yearly festival that's hosted at Silver Dollar City theme park.